The Rues and the Parkers are back at it again! 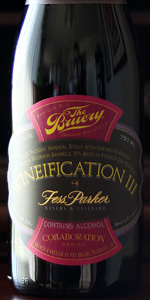 In this third rendition of Wineification, they continue to vanquish the boundaries between wine and beer, combining their brains and brawn with a blend of juicy grenache grapes from Rodney's Vineyard and Black Tuesday from The Bruery. Matured in a combination of bourbon and French Oak barrels, Wineification III is a complex and careful balance of rich, juicy grenache flavors, earthy tannins, artisan dark chocolate, scorched honey and bourbon warmth to embrace the winey character with open arms. A - Poured into a standard tulip a nice ruby mud no head but really phenomenal legs. S - Aromas of nice juicy Syrah grapes, light chocolate, old almost stale beer. High test alcohol. M - Mouthfeel is lightly carbonated, little sweet and sticky. Incredibly incredibly boozy. O -Overall this was an incredibly boozy black Tuesday treatment. Really lackluster. T: Taste is red wine and red berries with some currants and oak. Hints of caramel and vanilla intertwine at times. Chocolate and roasted malts come in at the mid palate and back end but the red berries and grapes maintain a strong presence. Swallow is oaky and lightly tannic while the grapes and a little cocoa powder fade into the finish. Whispers of the bourbon barrel are there on the finish as well. M: This beer is fairly full bodied with a slightly slick yet sticky feel in the mouth. Carbonation is low but adequate for the style and ABV while the beer has a drying finish. O: This is a very impressive beer. It's hard to describe how odd this sounds at first but it works so well. Definitely a nice twist and very enjoyable. My love for this may be greater than my love for any of the weekday beers and Chocolate Rain.